I spend most of my time on dogster (which is why I haven't had my photos updated/slacker typist should be fired), but headed over here to check out how catster was dealing with the changes. I can honestly say I like the changes here better. But I do wish that some stuff was back to how it was. I can live with the background here. I hate the grass back ground on dogster. Like many of you I won't be renewing my plus. But that's because I was already coming on here less and didn't like spending my money on it. We are not happy about the changes so far. If Mom hadn\'t received messages in her personal e-mail that I was a DDP yesterday, we never would have known since it took us a while to find Diary Central when we logged in. We miss the home page and don\'t like that it takes extra clicks to find things. Did Catster consult with any Plus Members before they made these changes? We\'d like to know if there was a test group involved before they rolled this out :? Who are you and what did you do to our Catster? We wants it back!! Lucy, we loved your diary entry =D> We agree completely about the Catster Community being buried underneath too many \"layers\" and we are afraid that new potential members won\'t be able to find this pawsome community of cat lovers. We can deal with the technical problems of having our pages messed up (although that is very frustrating, too), but we hope Catster will seriously rethink the fact that the Catster Community is not easily accessible anymore - that is a HUGE mistake, in our opinion, and will cost them new members. Eh - eh - eh - Error 6 )!:))!:))! Dis wut I tink ob da changes PFFFFFFFFFFFFFFFFFFFFFFFFFFFFFFFFFT!!! HISSSSSSSSSSSSSSSSSSSSSSSSSSSSSSS!! NUTRO FOOD BEIN RECALL AGIN WHY DEY AVERTISIN HEER???? Dat take away kredibilitee frum Catster!!! SPPPPPPPPPPPPPPPPPPPPPPIiiiiiiTTTTTTT!! It Konfoosing, dis noo stuffs. I dunno likes da noo logo. I WANTS MY OLD CATSTER BAK!!!! I agree completely. The changes have not been good for the community. Miles has posted suggestions in several places about how they could improve this design to make it work better for the members, and I hope they listen! But HQ you need to take a good hard look at who is complaining here. It's the members who helped you get where you are today. If you're more interested in attracting new members than keeping the old, fine. But you're making a mistake. P.S. We've made many friends on Catster. Our moms are now friends on Facebook. So if we quit paying we won't be losing touch with our friends. But the danger is that more and more of us will be doing our communicating on FB INSTEAD of Catster and that will hurt the community and ultimately hurt your business. Might be longer term, but it will. As I said in another post, Catster has really dumped the dirty kitty litter all over this! They bring in NUTRO as a advertiser, AFTER last year with the recall of the product that caused illness and death in cats and dogs. Here is a link: http://www.consumeraffairs.com/recalls04/2009/nutro_cat_food.html Why do we NEED a link to twitter or facebook? I am sure if there are anyone on here that belongs to those sites, they will already have them BOOKMARKED in their favorites. We do not need anything more on our pages. As I have seen others comment on, what happened to our cute Catster logo??? It was so sweet to see the \"A\" shaped like a kitty face. Now it is plain like yogurt...yuck. But most of all, and again...our pages have been pushed off to the side, as though we don\'t matter anymore. I thought THAT was the point of Catster, to bring people together who love cats, to make pages to show them off, and get to know one another? Now it just looks like any other search engine on the internet. Our pages are shoved off to the side like a afterthought... Finally, what about the money we spend here on Catster??? Consider together the fees of the Plus members here on Catster, then add it do those on Dogster! Then what about the cost of Zealies??? Both Plus and non-Plus member buy those. I would just LOVE to see how much they pull in from that every month! Don\'t be afraid to voice you opinions!!! What can they do? Take down the thread? Catster HQ should have considered ALL of us before taking these changes. They did not...they need to know how we feel. I, too, agree with everybody else. These changes are just awful, and our community is just being pushed aside. It was the Community and how wonderful and knowledgeable it is that drew us to Catster years ago, how very, very sad it is to see it buried so deeply now. How odd, when so many other sites seek to BUILD communities, that Catster seems to be trying to gradually eliminate us. I guess I just don't understand why Catster has chosen to alienate us. It makes me wonder just how long our individual pages will even last. Well, I was glad to see the awful pea-soup green gone, and I understand (I think) the rationale behind the berber carpet; it is neutral - and appropriate for cats. I found that if you click on "Catster" at the top of the page, you're taken to the old homepage - complete w. pea-soup green and the cute Catster logo with the "a" face. However, the other things are missing - COTD, COTW, DOTD. Maybe that's being fixed? My pages still look ok EXCEPT that I cannot change the background on Morganna's page. For some reason, Photobucket says I've exceeded bandwidth, but I don't know how: the background used to work. So, ok, I'll change it to a plain color but NOTHING works! No matter what code I enter, I still a have the berber carpet background. I'm late for lunch, and I'm hungry...the page will just have to stay as it is, as I'm out of ideas for what to try. Well said Hook! Basically, I agree with you and the other posters. My comments were posted on the comments section of the homepage and in another forum thread and I wrote my opinion in my diary yesterday, so I don\'t need to repeat it here. If I didn\'t love Catster so much, I wouldn\'t be so upset! 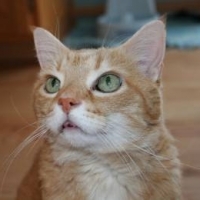 The Catster we\'ve known and loved is changing and not for the good of the community members. It\'s in the process of re-inventing itself and turning itself into just another of the thousands of bland, fluffy information sites for web browsers. The community, which was the reason Catster even exists in the first place and which has been the heart and soul of Catster since it began, is now secondary. Catster is losing it\'s soul for advertising dollars! Now that we\'ve been relegated to secondary status and with all of the extra clicking we need to do, the Catster community feels less accessible, harder to reach and everyone seems distant. It\'s like my friends suddenly all moved to a different city or state! Not impossible to visit but time-consuming and inconvenient. Sounds silly but that\'s how it feels to me. At this point, we don\'t know if we\'ll be renewing our CatsterPlus membership next year. Maybe Catster could find a way to keep the community and information websites separated? When Community members log on, they would immediately be on the Community Homepage (hopefully revised from what it is now!) There could be a link from the Community to the info stuff but it would be on the far right side of the page where the community button is now. When you\'re in the Community section, the links and button bars should all focus on the community itself and not the info site like it now does. Well I agree 100% with you guys. Mom has emailed them & she called them yesterday to no avail. She wrote about it in my diary, the lady didn't sound like much was planned to do at the time. So I'm thinking purrhaps we all need to start calling in about & then maybe they will see that we are serious about this issue. Maybe I should have asked to speak to Ted, don't know. But if anyfur is interested in calling, you can go here to get their number. http://www.catster.com/about/contact.php It's on their About Us page. Icebox - well said. The cosmetic changes of background, etc. are something we can deal with. It\'s the way I feel the true community is being treated that makes us so sad. Catster is all about cats - we are the ones who spread the news to friends about what a great place it is - the caring, loving connections that are made, the common experiences we share. And when the Top Cat has not said one word yet, it is very upsetting. We shouldn\'t have to call HQ. We\'ve expressed our feelings in the forums, in our diaries, and every other place we can. They need to realize that pushing us under the sissel carpet is not going to work. If they don\'t want us here, then fine, we will make this place a ghost town! We have tried to keep the fun going over the past year when it is obvious that so many have left to play over on Facebook. And just when we rolled out a great contest that was conceived by Catster members, all this change happens. The Cat\'s Meow graciously posted the info on the Buzzin\' into Spring contest, and now The Cat\'s Meow blog is buried so deep that most cats will not even realize the contest is going on. Please HQ - respond to us! It\'s the least you can do after this big change! Nice post, Icy, we meow your sentiments exactly! We\'d also love to hear what HQ is thinking about the feedback they are receiving - are they listening? Facebook responded rather promptly when users were up in arms about the personal privacy issues - we hope Catster will also respond to its customers. We don't like the new catster pages. First of all, the main page has a lot going on, and you would never really know that catster is a community first and foremost from that page. Is it?? The most important thing to us is all the wonderful friends we've made and frankly we don't pay too much attention to the other stuff unless momma gets more free time on ocassion. The opening page is 'busy' with too much going on, and so is the community page. It lacks the warmth it had and has too much of a commercial feel. We don't mind the new background (sissal and toys - they are sorta cute) but the white background all over the place is not 'easy on the eyes' and also seems to block a lot of the hard work that many catsters have put on the background of their pages. my opinion is you go back to the way catster was and keep working on the upgrade. We support change if it is good. We still love catster and more importantly our friends here that make it such a wonderful place. Helloooooo HQ anybody home?? Toss the new stuff in da giganticat litter box and don't recycle it! I can't even find my furiends whooza missing and my groups and never sees a Cat of the Day, a Cat of the Week, a Diary Pick - nothing! I can't find nothing! Yep uh huh CATSTER, youza gotta purroblem with yur deeziner - musta been a teenaged golpher who deezined it!